4000 kilometers and 15 days of exploring and experiencing what this country is all about. The trip started with a mixture of ideas, feelings, emotions and it ended with an even bigger mixture of all mentioned above. But at least, in the end, some of my questions got the answers I was hoping for. Sometimes, maybe, I got more answers than needed, but it was helpful in getting a more clear view of the reality surrounding South Africa. South Africa has a long history and it’s the starting point for anyone who plans to visit and tries to understand this country. I started preparing for the trip by reading Alex Perry’s book ‘The Rift – A New Africa Breaks Free’ which gave me a very good insight over the political and social situation in the countries in the African continent, including South Africa. Getting there, we had the chance to meet someone who is very much involved in the realities of South Africa and who managed to explain what South Africa is all about, how it got to where it is today and what is supposed to happen next with this country. Analyzing it from the perspective of a Romanian, meaning an Eastern European country, trying to develop and be part of the Western civilization, I could say that we are not so different from South Africa. We’ve both had our share of some nasty situations in our history, we both have our rich and poor, we both are struggling to live in a democratic country, where politicians exist for the well-being of the people, where corruption doesn’t exist anymore and where people feel that the right thing is being done. We are both working on building a middle class, with corporations coming to invest, we are both trying to offer education to the poor, to allow them to get out of their limitations, we are both working on developing our countries, which have so much potential in all areas. Driving all those 4000 kilometers gave us the chance to see a big part of the country. We’ve checked out some of the biggest cities, had a swim in the two Oceans, hiked a bit, passed through lots of small towns. South Africa is a beautiful country, with wild life, with a mixture of culture that makes it fascinating, with modern touches, but also keeping alive all those old traditions. South Africa is a country that is still building its identity as a democratic state, people are trying to get over the past, to forget and forgive, they are in full process of learning to live together, despite the race, after a painful history that has left deep wounds over the years. This is how our 15 day-trip looked like. For some of the places we saw, I will go into more detail in others posts, some I will just mention now. 13 kilometers from the town of Sabie, the Mac Mac twin falls plunge 70 meters in the gorge below. This waterfall was originally a single stream, but gold miners blasted it with dynamite to divert the river in an attempt to work the rich gold-bearing reef over which it plunges. 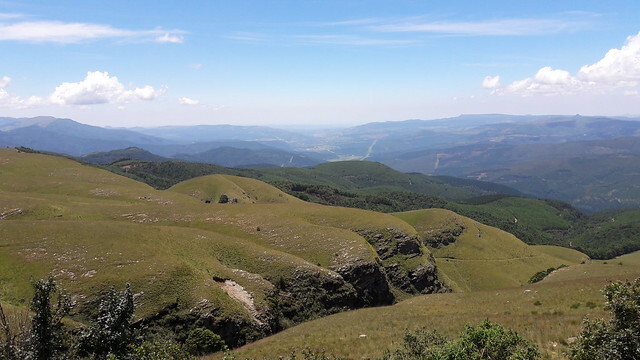 God’s Window is situated on the Drakensberg escarpment in Mpumalanga and the panoramic views it offers, really makes it be proud of its name. God’s Window is a small part of a 250km long earthwork of sheer cliffs and extravagant beauty. One can observe the hills and forests as far as the eye can see. Right from the parking, with a bit of easy hiking you will be at the actual view points in no time. For exotic forest plants, hike up into the misty Rain Forest and for even more view points that just make you stop breathing from the beauty arising in front of you. Bourke’s Luck Potholes in Mpumalanga province are a series of natural geological formations looking like small pools, at the point where Treur River joins the Blyde River. Over time, some of these potholes merge and new ones form, creating an intricate landscape of deep depressions and outcrops of resistant rock. The bridges build over these amazing pools, offers you the chance to view them from all possible angles. The Sterkfontein Dam is located in the Eastern Free State provence and its waters spread over 7000 ha. The area around it is perfect for a weekend getaway, offering wildlife, birding, windsurfing and fly fishing with a magnificent view over the Drakensberg. Howick Falls is a waterfall in Howick, KwaZulu-Natal Province. The waterfall is approximately 95 m in height and lies on the Umgeni River.There are also a series of interesting walks and trails, some to the bottom of the falls. The official Howick Falls Gorge Walk begins at the bottom of Harvard Street and makes its way to the seat of the falls. Port St John’s was our first encounter with the Indian Ocean. Port St Johns is a town of about 6,500 people on the Wild Coast in the Eastern Cape province. It is situated at the mouth of the Umzimvubu River, 220 kilometers northeast of East London. We only spent one night in this nice , a bit remote place, and our accommodation (The lodge on the Beach) was right on the beach. Perfect spot for waking up and having a nice walk on the Second Beach and enjoy a fresh swim in the Indian Ocean. Before leaving Port St John’s, we stopped at Wood’n’spoon for lunch where we had a delicious freshly caught crayfish. In Kidd’s Beach we stopped for one night on our way to Garden Route. It has a very nice beach, unfortunately the Ocean waters were too cold to allow us to enjoy a day at the beach with swimming included. We had dinner at the beach restaurant, The Blue Dolphin (there is another restaurant in the area, but it was closed), but we were a bit disappointed about the experience. There will be more details on the places we visited in the next posts, but for now, this is the big picture of how our South African trip looked like. There were so many times when we felt completely amazed by what we saw in front of our eyes, times when we enjoyed the quiet and tranquility of so many beautiful places, but also times when we felt we would scream and cry seeing the realities of the African society. Like someone said during the trip…life is unfair, and unfortunately sometimes one can’t do too much about it.